At some point, he sneaked off (let me pause for a moment to say that using the word "sneaked" feels completely awkward to me, but spell check is telling me that "snuck" is not a word) ... which usually isn't a good thing. So when Charlie started calling for him, and we found Jack standing at the top of the stairs, all dressed for his day, announcing "HERE!" ... I was relieved that he hadn't been secretly trashing some part of the house, and sad in the realization that my big baby boy had picked out a weather appropriate outfit, and put it on himself. I am fighting this growing up thing, and it's not working. At all. Plan B: To savor every moment of every age, because dang it- it's passing too quickly. p.s. 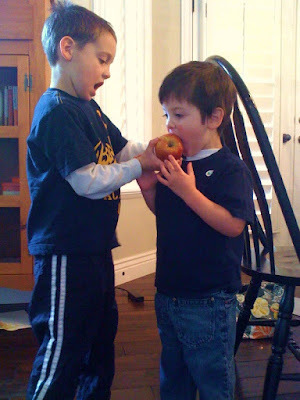 today he asked me to "chip" his apple- which meant he wanted me to take the first bite so he could eat it. And I don't want to forget that either. Having the little ones grow up is bittersweet. Just take lots of pictures because it does go way too fast. i echo granny. love the chipping thing. did he come up with that on his own? enjoy the moments they do pass too quickly. LOL, I love how Charlie has his mouth opening like he is helping Jack chip it. So funny! I just noticed Jack has his pants on backwards. That kid is hilarious! I love him and the others!